The transcription here is an exact copy of the words in the book - warts and all ! 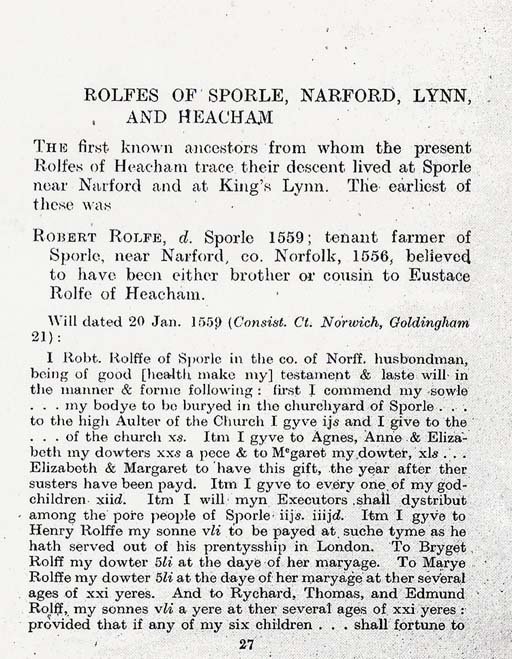 ROBERT ROLFE, d. Sporle 1559; tenant farmer of Sporle, near Narford, co. Norfolk, 1556, believed to have been either brother or cousin to Eustace Rolfe of Heacham. [die, their share is to be] equally divided among the rest of my children then remaining alyve & unmaryed. Itm I will that my ... in Sporle, of xv acres & a half of land thereto belonging, that 1 bought of Rychard Wentland shall be sold by myn executrix for the duo performance of this myn last will & testament. Itm I gyve to Henry, my sonne, my best gaberden. Itni I give to Rychard my sonne, my best gaberden. Itm I gyve to Rychard my sonne my black chamblet ("Camlet from Norwich " was a material, a mixture of wool and silk) jacket. Itm I will that Thomas & Edmund my friends shall have each of them a doblet of worsted. The residue of all my goods & chattels unbequeathed I [place at the] disposition of Margaret, my wyfe. whom I make my sole executrix, etc. Witnesses, Henry Thetford, Rychard Myndm. Edmund Audly & Thomas Slade. Proved, Norwich, 10 Oct. 1559. Edmund , see p. 34. Will (P.P.C. 12 Bolein) dated 8 May 1602 and proved 22 Feb. 1602-3 by John Burrough, notary public, proxy for William Pettus, the executor named in the will. This will is the most important document extant for the history of the family at this time, and so we give a fairly full abstract of it. I give to Marie, my daughter 500l. together with the lease of my late dwelling house in St. Lawrence Lane, London & one other lease which I have of my brother in law William Howe, of certain lands & tenements, in the parishes of Mucking, Horndon on the Hill, & Curringham known by the names of Cowe Leaze, Chelley and rugway marsh, my said daughter paying to the churchwardens of Mucking, during the con¬tinuance of my estate, for the benefit of the poor there, 40s. yearly ; also 500l. and all my copyhold lands & tenements in Mucking held of the manor of Mucking. " The remainder thereof " to my daughters Elizabeth & Anne, " the remainder thereof to Henry Rolf son of my brother. Edmond Rolf." Should I die without having made surrender of my said lands then my daughter Elizabeth and William Pettus her husband & my daughter Anne and John Crowch her husband & my daughter Marie & such husband as she shall fortune to marry shall surrender the same to the uses of my will. To my said daughter Anne, my freehold lands in Shenfield co. Essex, late bought of John Woode, esquire &	his wife, with remainders to my daughters Elizabeth & Mary ; also my lease of certain houses new built by me in Grub Street, London, my said daughter Anne to distribute one dozen penny loaves, thirteen to the dozen within the parish church of St. Gyles without Cripplegate during the said lease, amongst the poor inhabitants, after morning prayer, every sabbath. And my said daughter Anne and her husband making to Thomas Kelley, citizen and Imbrotherer of London one lease for 21 years, rendering payment as by two several draughtes in paper, in my custody & the said lease or leases to be had and made of that messuage wherein the said Thomas Kelley now inhabiteth, parcel of the said demised promises & under such agreements, (excepting only the reservation of the rents aforesaid) as one Ruddyarde his assign now holdeth one other messuage parcel of the said demised premisses contained in the said original lease. To my said daughter Anne, the 200l. remaining of my promised porcon of 500l. given in marriage with my said daughter to the said John Crowch, which remaineth unpaid by reason that John Crowch father to my. said son in law hath not as yet performed that jointure, which, by him was pro¬mised ; also all such portion of money & other things as remaineth uppon accompt betwixt me & my cousin Edward Barkham, touching our dealings and debt late of one Blieth deceased & also 200l. All these bequests to my daughter Anne I give on condition that the said John Crowch the father, within 6 months of my decease settle upon the said John Crowch & Anne his wife, lands of the yearly value of 80l. 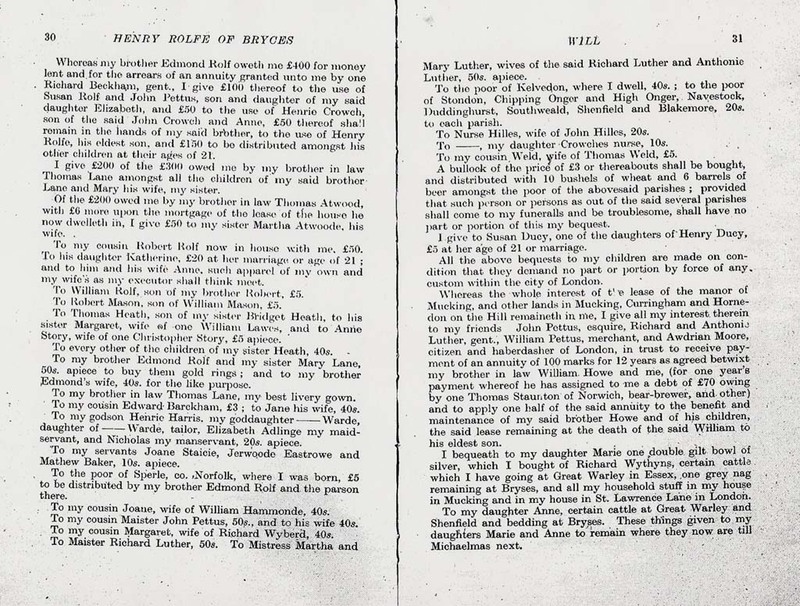 Whereas my brother Edmond Rolf oweth me £400 for money lent and for the arrears of an annuity granted unto me by one Richard Beckham, gent., I give £100 thereof to the use of Susan Rolf and John Pettus, son and daughter of my said daughter Elizabeth, and £50 to the use of Henrie Crowch, son of the said John Crowch and Anne, £50 thereof shall remain in the hands of my said brother, to the use of Henry Rolfe, his eldest son, and £150 to be distributed amongst his other children at their ages of 21. I give £200 of the £300 owed me by my brother in law Thomas Lane amongst all the children of my said brother Lane and Mary his wife, my sister. Of the £200 owed me by my brother in law Thomas Atwood, with £6 more upon the mortgage of the lease of the house he now dwelleth in, I give £50 to my sister Martha Atwoode, his wife. To my cousin Robert Rolf now in house with me. £50. To his daughter Katherine, £20 at her marriage or age of 21 ; and to him and his wife Anne, such apparel of my own and my wife's as my executor shall think meet. To William Rolf, son of my brother Robert, £5. To Robert Mason, son of William Mason, £5. To Thomas Heath, son of my sister Bridget Heath, to his sister Margaret, wife of one William Lawes, and to Anne Story, wife of one Christopher Story, £5 apiece. To every other of the children of my sister Heath, 40s. To my brother Edmond Rolf and my sister Mary Lane, 50s. apiece to buy them gold rings; and to my brother Edmond's wife, 40s. for the like purpose. To my brother in law Thomas Lane, my best livery gown. To my cousin Edward Barckham, £3 ; to Jane bis wife, 40s. To my godson Henrie Harris, my goddaughter	Warde, daughter of	Warde, tailor, Elizabeth Adlinge my maidservant, and Nicholas my manservant, 20s. apiece. To my servants Joane Staicie, Jerwoode Eastrowe and Mathew Baker, 10s. apiece. To the poor of Sperle, co. Norfolk, where I was born, £5 to be distributed by my brother Edmond Rolf and the parson there. To my cousin Joane, wife of William Hammonde, 40s. To my cousin Maister John Pettus, 50s., and to his wife 40s. To my cousin Margaret, wife of Richard Wyberd, 40s. Mary Luther, wives of the said Richard Luther and Anthonie Luther, 50s. apiece. To the poor of Kelvedon, where I dwell, 40s. ; to the poor of Stondon, Chipping Onger and High Onger, Navestock, Duddinghurst, Southweald, Shenfield and Blakemore, 20s. to each parish. To Nurse Hilles, wife of John Hilles, 20s. To , my daughter Crowches nurse, 10s. To my cousin Weld, wife of Thomas Weld, £5. A bullock of the price of £3 or thereabouts shall be bought, and distributed with 10 bushels of wheat and 6 barrels of beer amongst the poor of the abovesaid parishes ; provided that such person or persons as out of the said several parishes shall come to my funeralls and be troublesome, shall have no part or portion of this my bequest. I give to Susan Ducy, one of the daughters of Henry Ducy, £5 at her age of 21 or marriage. All the above bequests to my children are made on con¬dition that they demand no part or portion by force of any custom within the city of London. Whereas the whole interest of the lease of the manor of Mucking, and other lands in Mucking, Curringham and Horne-don on the Hill remaineth in me, I give all my interest therein to my friends John Pettus, esquire, Richard and Anthonie Luther, gent., William Pettus, merchant, and Awdrian Moore, citizen and haberdasher of London, in trust to receive pay¬ment of an annuity of 100 marks for 12 years as agreed betwixt my brother in law William Howe and me, (for one year's payment whereof he has assigned to me a debt of £70 owing by one Thomas Staunton of Norwich, bear-brewer, and other) and to apply one half of the said annuity to the benefit and maintenance of my said brother Howe and of his children, the said lease remaining at the death of the said William to his eldest son. I bequeath to my daughter Marie one double gilt bowl of silver, which I bought of Richard Wythyns, certain cattle which I have going at Great Warley in Essex, one grey nag remaining at Bryses, and all my household stuff in my house in Mucking and in my house in St. Lawrence Lane in London. To my daughter Anne, certain cattle at Great Warley and Shenfield and bedding at Bryses. These things given to my daughters Marie and Anne to remain where they now are till Michaelmas next. All my plate (except as above bequeathed), jewels and gold shall be placed in the chest at my trundle-bed's feet in my own bedchamber, and the key delivered to my friend Maister Anthonie Luther, till he and his brother Richard Luther, with their two wives, shall be so near as they conveniently may make an equal division thereof into three lots; and three lots or scrolls in parchment or paper shall be made thereof, and put into one hat, bonnet or other things, and my three daughters shall not see what is contained therein, but by chance shall take out such of the said scrolls or lots as shall happen to them, wherewith they shall rest contented for their parts of my plate and jewels, etc. All the residue of my goods I give to my daughter Elizabeth and her husband William Pettus. which William I appoint my sole executor, and my friends Anthonie Luther and Maister Adryane Moore to be overseers. Arms: Gyronny or and azure, on a chief sable three annulets argent. m. Mary † d. of Thomas Howe, citizen and Salter and citizen and fishmonger of parish of St. Botolph's, Billingsgate, London, d. before her husband, and left female issue only. 1. Elizabeth, b. 1573. d. of Henry Roofe or Rolfe of London, merchant; d. widow of par. of St. Martin's Ongar, City of London; will dated April 1634, pr. (P.C.C. 28 Seager) 29 April 1634.
m. i., circ. 1600, William Pettus of London, merchant, s. of — Pettus of Norwich (Visit of Essex). He d. 1608; will P.C.C. For their issue, see p. 283.
m. ii., before 1614, Sir Francis Jones, Kt., haberdasher, Lord Mayor of London, 1620. 3. Mary, b. 1582, d. of Henry Rolfe of Kelvedon. m. 1602, Adr. Moore, haberdasher of St. Antholin's (Lond. Marr. Licences). Ho m. ii., 1604, Margaret Vethall and iii. Mary Rawlins. • A Sir John Pettus, Knight, was M.P. for Norwich 1601, and Mayor 1608. His portrait hangs in the Guildhall Norwich, and was engraved in 1841. † Her sister Jane Howe m. before 1568, as his first wife, Dr. Francis Anthony, a celebrated physician in the time of King James I. The other children of Robert Rolfe were :. 3. 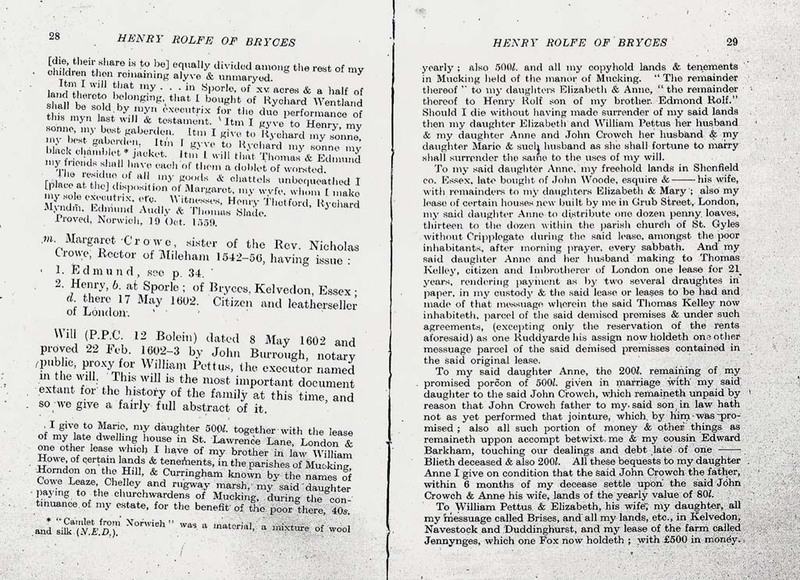 Robert, mentioned in his brother Henry Rolfe of Bryces' will, as having a s. William. 4. Thomas of Tuttington, mentioned in his father's will. His own will, dated 1599, mentions his only s. Clement, from whom the Rolfes of Tuttington are descended. See p. 289. 1: Robert Lane. d. s.p., D.D., Fellow of St. John's Coll., Cam¬bridge. Will proved (P.C.C. 71 Seager). 19 July 1634. 2.Thomas Lane, merchant of Norwich. Will pr. (P.C'.C. 18 Skynner) 3 Feb. 1627. m. Alice ——, and had issue. 3. Alexander Lane, merchant of Norwich, d. unm. Will pr. (P.C.C. 35 Clarke) 8 March 1625. 4. Henry Lane of Norwich, living 1634;. m. Elizabeth ?? ?, and had issue. 5. Anne Lane, m. Nathaniel Remington and had issue. 6. Hester Lane, living unm. 1626. 7. Lidia Lane, m. after 1614 —.— Couk, and was a widow 1624. 1. Thomas Heath, living 1602. 2. Margaret Heath, m. William Lawes. 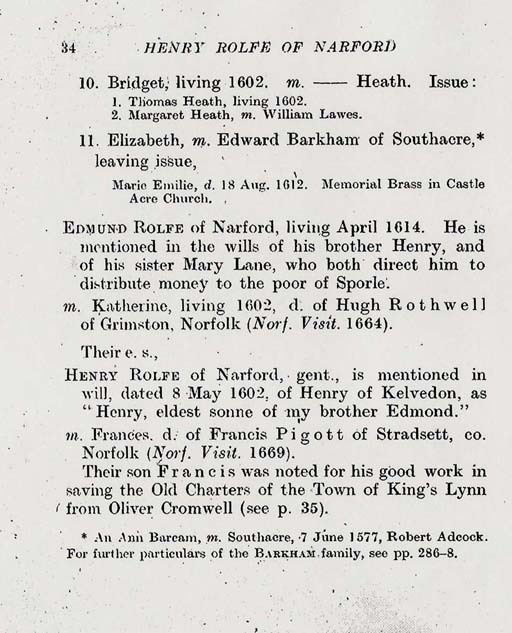 EDMUND ROLFE of Narford, living April 1014. He is mentioned in the wills of his brother Henry, and of his sister Mary Lane, who both direct him to distribute money to the poor of Sporle. m. Katherine, living 1602, d. of Hugh Rothwell of Grimston, Norfolk (Norf. Visit. 1664). HENRY ROLFE of Narford, gent., is mentioned in will, dated 8 May 1602: of Henry of Kelvedon, as "Henry, eldest Sonne of my brother Edmond." m. Frances, d. of Francis Pigott of Stradsett, co. Norfolk (Norf. Visit. 1669). Their son Francis was noted for his good work in saving the Old Charters of the Town of King's Lynn from Oliver Cromwell (see p. 35). 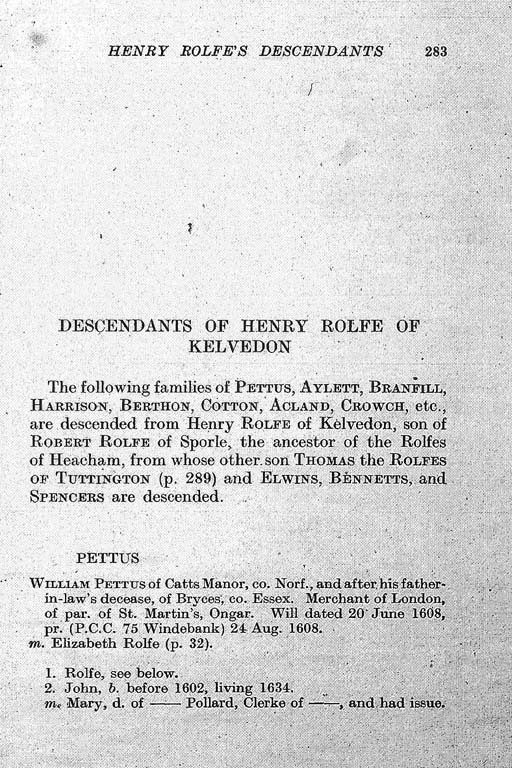 The following families of PETTUS, AYLETT, BRANFILL, HARRISON, BERTHON, COTTON, ACLAND, CROWCH, ETC., are descended from HENRY ROLFE OF KELVEDON, son of ROBERT ROLFE OF SPORLE, the ancester of the ROLFES OF HEACHAM, from whose other son THOMAS the ROLFES OF TUTTINGTON (P. 289) and ELWINS, BENNETTS, and SPENCERS are descended. WILLIAM PETTUS of Catts Manor, co. Norf., and after, his father-in-law's decease, of Bryces, co. Essex. Merchant of London, of par. of St. Martin's, Ongar. Will dated 20 June 1608, pr. (P.C.C. 75 Windebank) 24 Aug. 1608.
m. Elizabeth Rolfe (p. 32). 2. John, b. before 1602, living 1634.
m, Mary, d. of —:— Pollard, Clerke of —-—, and had issue. 3. William, living 1637 (see Admin, granted to him of his father's goods). 4. Susan, b. before 8 May 1602, ment. in Mary Lane's will. m. after 1614 to Abraham Jones of Welford, co. Berks., who d. before 1634 (son of Sir Francis Jones, Kt., by his first wife). Their s. Richard Jones of Welford d. 1664, before the Berks. Visit of that year, leaving an heiress, Mary, aged 5 years. 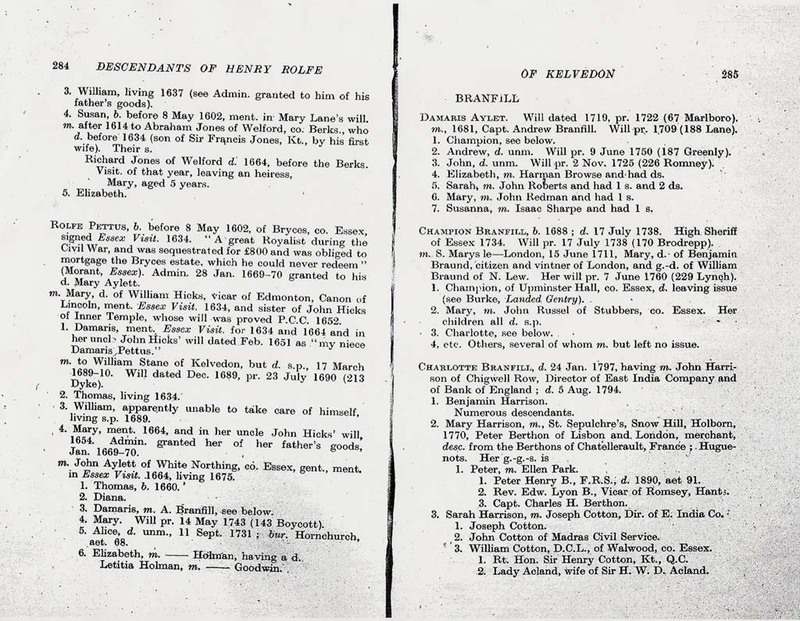 ROLFE PETTUS, b. before 8 May 1602, of Bryces, co. Essex, signed Essex Visit. 1634. "A great Royalist during the Civil War, and was sequestrated for £800 and was obliged to mortgage the Bryces estate, which he could never redeem " (Morant, Essex). Admin. 28 Jan. 1669-70 granted to his d. Mary Aylett. m. Mary, d. of William Hicks, vicar of Edmonton, Canon of Lincoln, ment. Essex Visit. 1634, and sister of John Hicks of Inner Temple, whose will was proved P.C.C. 1652. 1. Damaris, ment. Essex Visit, for 1634 and 1664 and in her uncle John Hicks' will dated Feb. 1651 as "my niece Damaris Pettus." m. to William Stane of Kelvedon, but d. s.p., 17 March 1689-10. Will dated Dec. 1689, pr. 23 July 1690 (213 Dyke). 3. William, apparently unable to take care of himself, living s.p. 1689. 4. Mary, ment. 1664, and in her uncle John Hicks' will, 1654. Admin, granted her of her father's goods Jan. 1669-70.
m. John Aylett of White Northing, co. Essex, gent., ment. in Essex Visit. .1664, living 1675. 3. Damaris, m. A. Branfill, see below. 4. Mary. Will pr. 14 May 1743 (143 Boycott). 5. Alice, d. unm., 11 Sept. 1731 ; bur. Hornchurch, aet. 68. 6. Elizabeth, m. Holman, having a d.Letitia Holman, m. Goodwin. .
DAMARIS AYLET. Will dated 1719, pr. 1722 (67 Marlboro). m., 1681, Capt. Andrew Branfill. Will pr. 1709 (188 Lane). 2. Andrew, d. unm. Will pr. 9 June 1750 (187 Greenly). 3. John, d. unm. Will pr. 2 Nov. 1725 (226 Romney). .
4. Elizabeth, m. Harman Browse and had ds. 5. Sarah, m. John Roberts and had 1 s. and 2 ds. 6. Mary, m. John Redman and had 1 s.
7. Susanna, m. Isaac Sharpe and had 1 s.
CHAMPION BRANFILL, b. 1688 ; d. 17 July 1738. High Sheriff of Essex 1734. Will pr. 17 July 1738 (170 Brodrepp). m. S. Marys le—London, 15 June 1711, Mary, d. of Benjamin Braund, citizen and vintner of London, and g.-d. of William Braund of N. Lew. Her will pr. 7 June 1760 (229 Lynch). 1. Champion, of Upminster Hall, co. Essex, d. leaving issue (see Burke, landed Gentry). .
2. Mary, m. John Russel of Stubbers, co. Essex. Her children all d. s.p. 4, etc. Others, several of whom m. but left no issue. CHARLOTTE BRANFILL, d. 24 Jan. 1797, having m. John Harri¬son of Chigwell Row, Director of East India Company and of Bank of England ; d. 5 Aug. 1794. 2. Mary Harrison, m., St. Sepulchre's, Snow Hill, Holbom, 1770, Peter Berthon of Lisbon and, London, merchant, desc. from the Berthons of Chatellerault, France ; Huguenots. Her g.-g.-s. is	,	. " 1. Peter, m. Ellen Park. 1. Peter Henry B., F.R.S., d. 1890, aet 91. 2. Rev. Edw. Lyon B., Vicar of Romsey, Hants. 3. Capt. Charles H. Berthon. 2. John Cotton of Madras Civil Service. 3. William Cotton, D.C.L., of Walwood, co. Essex. 1. Rt. Hon. Sir Henry Cotton, Kt., Q.C. 2. Lady Acland, wife of Sir H. W. D., Acland. JOHN CROWCH, b. 1519, Comeybury, clothworker of London ; bur. Layston Herts. m. Joan, d. and heir of John Scot of London. 1. Thomas of Corneybury, m. Sara Gallard (p. 288). 3. Margaret, Lady Barkham, Countess of Manchester and Lady Montague of Boughton. JOHN CROWCH, living 20 June 1608, of Alswick Hall, co. Herts. m., circ. 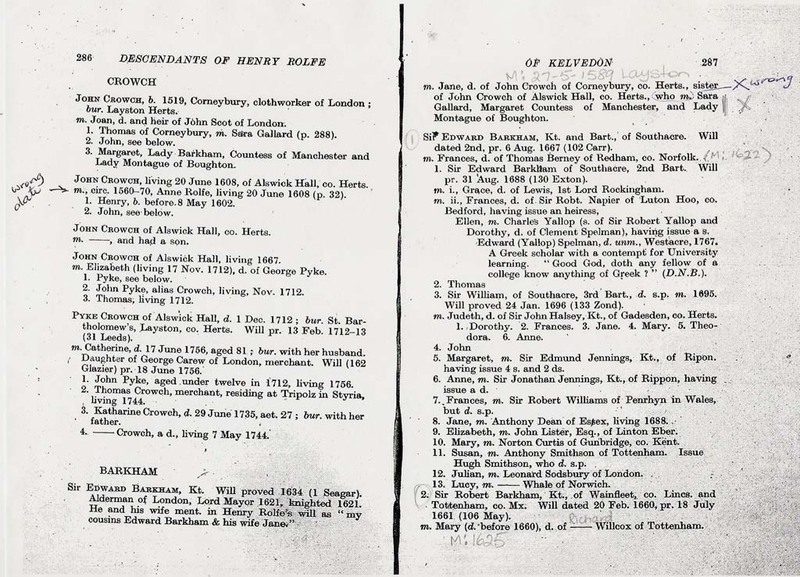 1560-70, Anne Rolfe, living 20 June 1608 (p. 32). 1. Henry, b. before. 8 May 1602. JOHN CROWCH of Alswick Hall, co. Herts. m. , and had a son. JOHN CROWCH of Alswick Hall, living 1667.
m. Elizabeth (living 17 Nov. 1712), d. of George Pyke. 2. John Pyke, alias Crowch, living, Nov. 1712. PYKE CROWCH of Alswick Hall, d. 1 Dec. 1712 ; bur. St. Bar¬tholomew's, Layston, co. Herts. Will pr. 13 Feb. 1712-13 (31 Leeds). m. Catherine, d. 17 June 1756, aged 81 ; bur. with her husband. Daughter of George Carew of London, merchant. Will (162 Glazier) pr. 18 June 1756. 1. John Pyke, aged under twelve in 1712, living 1756. 2. Thomas Crowch, merchant, residing at Tripolz in Styria living 1744. 3. Katharine Crowch, d. 29 June 1735, aet. 27 ; bur. with her father. 4. Crowch, a d., living 7 May 1744. Sir Edward Barkham, Kt. Will proved 1634 (1 Seagar). Alderman of London, Lord Mayor 1621, knighted 1621. He and his wife ment. 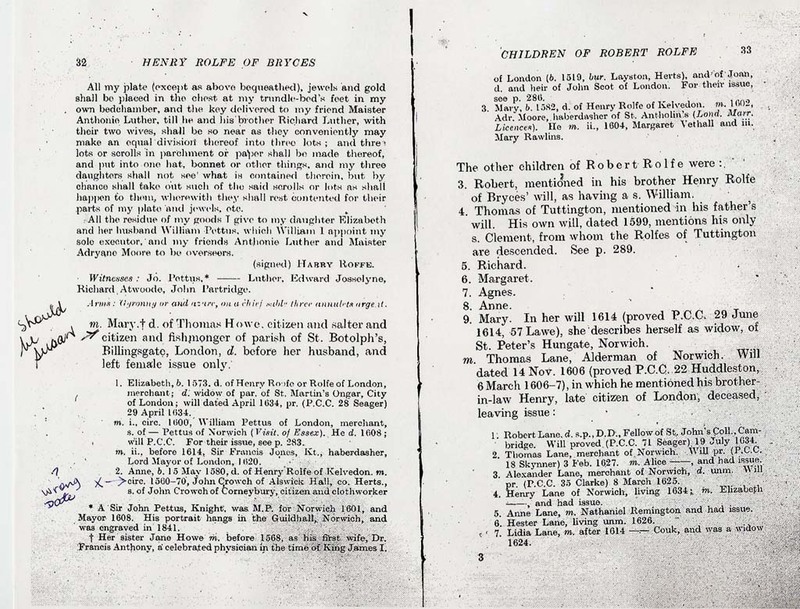 in Henry Rolfe's will as "my cousins Edward Barkham & his wife Jane,"
m. Jane, d. of John Crowch of Corneybury, co. Herts., sister of John Crowch of Alswick Hall, co. Herts., who m. Sara Gallard, Margaret Countess of Manchester, and Lady Montague of Boughton. dated 2nd, pr. 6 Aug. 1667 (102 Carr). 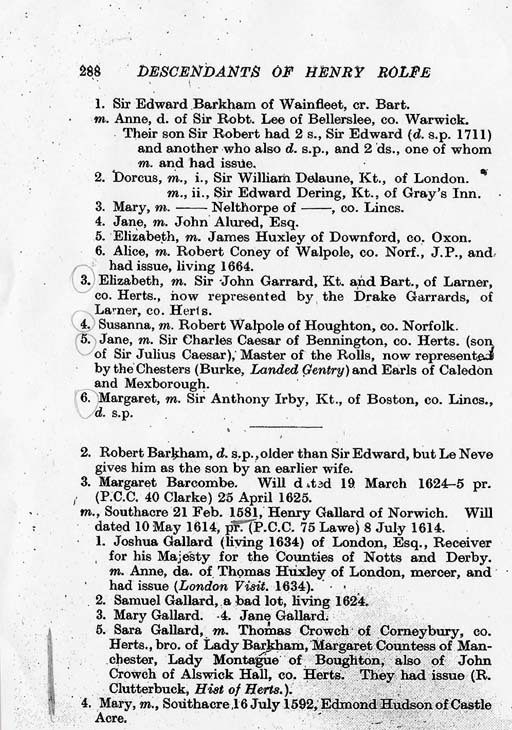 m. Frances, d. of Thomas Berney of Redham, co. Norfolk. 1. Sir Edward Barkham of Southacre, 2nd Bart. Will pr. 31 Aug. 1688 (130 Exton). m. i., Grace, d. of Lewis, 1st Lord Rockingham. Ellen, m. Charles Yallop (s. of Sir Robert Yallop and Dorothy, d. of Clement Spelman), having issue a s. Edward (Yallop) Spelman, d. unm., Westacre, 1767. A Greek scholar with a contempt for University learning. " Good God, doth any fellow of a college know anything of Greek ? " (D.N.B.). 3. Sir William, of Southacre, 3rd Bart., d. s.p. m. 1695. Will proved 24 Jan. 1696 (133 Zond). m. Judeth, d. of Sir John Halsey, Kt., of Gadesden, co. Herts. 1. Dorothy. 2. Frances. 3. Jane. 4. Mary. 5. Theo¬dora. 6. Anne. 5. Margaret, .m Sir Edmund Jennings, Kt., of Ripon. having issue 4 s. and 2 ds. 6. Anne, m. Sir Jonathan Jennings, Kt., of Rippon, having issue ad. 7..Frances, m. Sir Robert Williams of Penrhyn in Wales, but d. s.p. 8. Jane, m. Anthony Dean of Essex, living 1688. 9. Elizabeth, m. John Lister, Esq., of Linton Eber. 10. Mary, m. Norton Curtis of Gunbridge, co. Kent. 11. Susan, m. Anthony Smithson of Tottenham. Issue Hugh Smithson, who d. s.p. .
12. Julian, m. Leonard Sodsbury of London. .
13. Lucy, m.	Whale of Norwich. 2. Sir Robert Barkham, Kt., of Wainfleet, co. Lines, and Tottenham, co. Mx. Will dated 20 Feb. 1660, pr. 18 July 1661 (106 May). m. Mary (d. before 1660), d. of — Willcox of Tottenham. 1. Sir Edward Barkham of Wainfleet, cr. Bart. m. Anne, d. of Sir Robt. Lee of Bellerslee, co. Warwick. Their son Sir Robert had 2 s., Sir Edward (d. s.p. 1711) and another who also d. s.p., and 2 ds., one of whom m. and had issue. m., i., Sir William Delaune, Kt., of London. m., ii., Sir Edward Dering, Kt., of Gray's Inn. 3. Mary, m. Nelthorpe of	, co. Lines. 4. Jane, m. John Alured, Esq. 5. Elizabeth, m. James Huxley of Downford, co. Oxon. 6. Alice, m. Robert Coney of Walpole, co. Norf., J.P., and had issue, living 1664. 3. Elizabeth, m. Sir John Garrard, Kt. and Bart., of Larner, co. Herts., now represented by the Drake Garrards, of Larner, co. Herts. 4. Susanna, m. Robert Walpole of Houghton, co. Norfolk. 5. Jane, m. Sir Charles Caesar of Bennington, co. Herts, (son of Sir Julius Caesar), Master of the Rolls, now represented by the Chesters (Burke, Landed Gentry) and Earls of Caledon and Mexborough. 6. Margaret, m. Sir Anthony Irby, Kt., of Boston, co. Lines., d. s.p. 2. Robert Barkham, d. s.p.,older than Sir Edward, but Le Neve gives him as the son by an earlier wife. 3.Margaret Barcombe. Will dated 19 March 1624-5 pr.(P.C.C. 40 Clarke) 25 April 1625.
m., Southacre 21 Feb. 1581, Henry Gallard of Norwich. Will dated 10 May 1614, pr (P.C.C. 75 Lawe) 8 July 1614. .
1. Joshua Gallard (living 1634) of London, Esq., Receiver for his Majesty for the Counties of Notts and Derby. m. Anne, da. of Thomas Huxley of London, mercer, and had issue (London Visit. 1634). 2. Samuel Gallard, a bad lot, living 1624. 5. Sara Gallard, m. Thomas Crowch of Corneybury, co. Herts., bro. of Lady Barkham, Margaret Countess of Man¬chester, Lady Montague of Boughton, also of John Crowch of Alswick Hall, co. Herts. They had issue (R. Clutterbuck, Hist of Herts.). 4. Mary, m., Southacre 16 July 1592, Edmond Hudson of Castle Acre. To be kept up to date on the progress at Layston Church, ask any questions, or to tell us what you think of the project just send an email to info@layston-church.org.uk We would also be very interested to hear about any history of the church.